Traveling around the world can be lonely from time to time. Sure, because of the Internet we can stay in touch with friends and family back home. Yet, there's nothing like sitting around a dinner table with friends who speak your language and that you have something in common with. Having each other is amazing but meeting new friends is even better! We've been lucky enough in our travels to encounter some terrific people; from extended acquaintances to interesting fellow travelers. It's rare, however, to meet up with families that are enjoying the same lifestyle of full-time travel like we are. It takes a certain sense of adventure and willingness to live outside the mainstream paradigm to travel with kids. For that, we feel immediate kinship with the brave families that attempt this lifestyle. After four months of bouncing around different parts of Thailand and Laos, our plans were to check out Cambodia and Vietnam. However, because of business needs we were drawn to Malaysia. Isn't it interesting how circumstance and intuition lead the path you were probably supposed to take all along? Just before heading to Malaysia, we tapped into the family travel blogger community to seek more information about what to expect. To our pleasant surprise, one of the most active members of travel bloggers had a home base in Penang and encouraged us to visit their area. Knowing that local knowledge is always better than winging it, and encouraged that our kids could have playmates, we obliged. We did not expect the level of generous hospitality that followed. Tracy and Colin Burns, who run a family travel blog and a travel community website, treated us as nothing less than family. They took us to many local restaurants that we would have never found on our own. They taxied us to the mall on several occasions. And they gave us crucial business tips about local banking and travel blogging. We immediately felt comfortable with the Burns. Being from Australia, they spoke English, albeit with an excellently exotic accent to us Americans. After a few days palling around with them in Penang, they invited us to join them in the Perhentian islands. We jumped at the chance and crammed into their minivan for a 6-hour drive to the speedboat pier to visit these remote islands. The islands were something out of a movie. Crystal clear water, lively coral reef with brightly-colored fish, sea turtles and sharks, white sand beaches, good food and great company. The trip to Perhentians epitomized the full-time family vacation we envisioned for our world tour. Experiencing it with the Burns family made it that much better. When it was time to return to Penang, we discovered that our previous guest house was fully booked. Without hesitation, the Burns offered for us to stay at their house. Despite our immediate appreciation, we were nervous that we bring too much chaos with three rambunctious boys to accept. Yet, they insisted. They made us feel right at home giving us two of their bedrooms to bunk in. Tracy made a gourmet dinner our first night in their home. We continued our enlightening discussions about homeschooling and travel philosophy while the kids jumped on the trampoline and played extensively with almost no tears. They truly went above and beyond to help us and make us feel comfortable. For that, we can't even begin to express the proper level of gratitude to them. 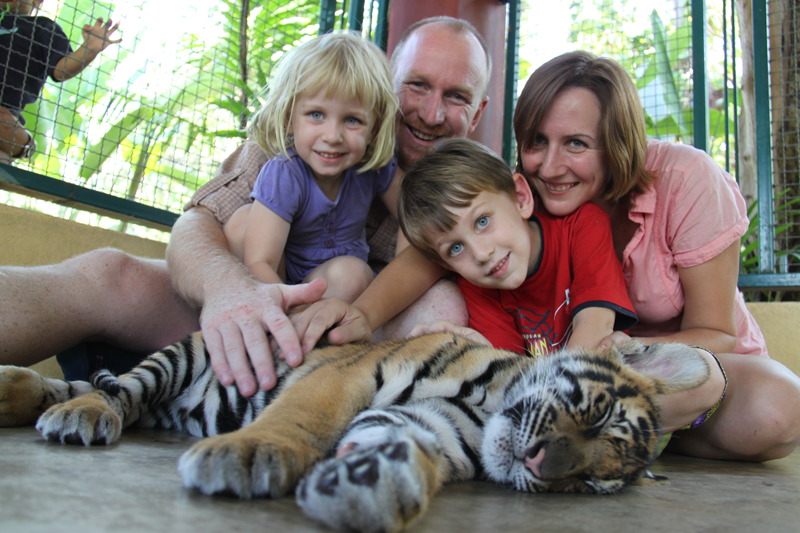 The immediate kinship of sharing the same lifestyle is an obvious attraction to family travel bloggers. But the unbelievably generous hospitality was something that was unexpected. Thank you Burns family from the bottom of our hearts. Your friendship means a lot to us. What a sweet post about a funtastic family :) We all loved hanging with them in Bulgaria! Hope to meet you down the road, too, Mary (and family)! Individuals who are interested in traveling around the world can make it easier on themselves and others like them by participating in an exchange. Members have the opportunity to stay in other people’s homes when they travel to different cities or countries.